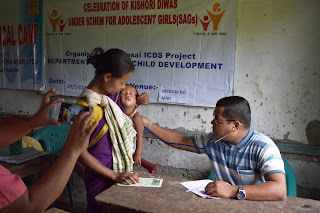 Vivekananda Kendra Arun Jyoti in association with Department of Women and Child Development (ICDS project), Namsai, Arunachal Pradesh organized mega medical and health awareness camps in three locations of Namsai district from 28th to 30th May 2018. Camps were organized at Piyong Khamti, Mengkeng Miri and Simolbari villages. The target groups were the adolescent girls, expecting women, lactating mothers and malnourished girl Children. 36 Anganwadi centers of Namsai and Piyong circle were covered. During the awareness meetings, various health issues like anemia, worm infection, consumption of safe drinking water, prevention of water borne diseases, menstrual hygiene, Institutional Delivery, Vaccination etc. were discussed by Arun Jyoti Medical Team. The Child Development Project Officer (CDPO) of Namsai and Piyong, Mrs. W.Tangha explained various schemes for Women and Girl Child. Local Panchayat leaders also participated in these meetings. A total 207 patients were treated for various ailments during the camp. Iron and Folic Acid tablets were given free of cost to all anemic women and girls after check up. Our Medical team has given counseling to adolescent girls.